← Fernandes II Steakhouse: We’re Still Full! 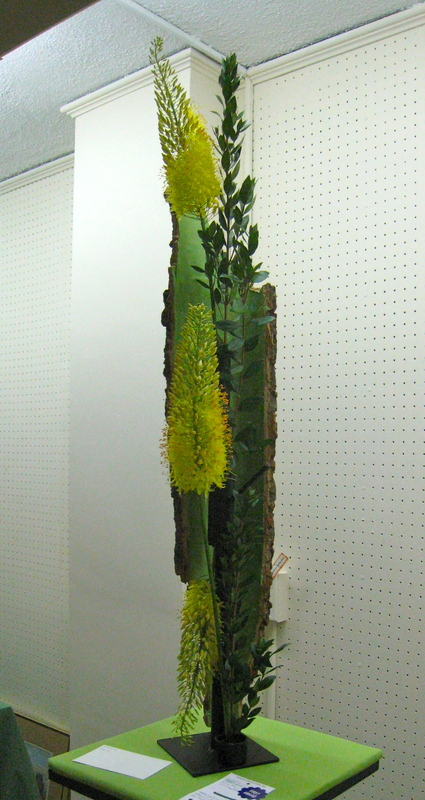 Today was my garden club’s final in-house floral competition for the 2010-2011 club year. As an Intermediate II designer I signed up to create a “Traditional Vertical Design placed on a table on the stage 42″ from the floor; allotted space 24″ deep x 24″ wide. Background and underlay optional.” Yes. Indeed I did. As usual, I purchased flowers on Friday afternoon, clipped them and put them to “condition” in my cool basement then I went about the business of having a productive and fun weekend. Sunday afternoon arrived and I brought the flowers up from downstairs and stared at them. And stared at them. And stared at them some more. Not really convinced I know what a traditional vertical design is, I Googled it and studied the results, then I grabbed my trusty “Designing By Types” book that I purchased at our club’s December tea; it inspired my topiary design last month. This month, however, I didn’t see what I needed. That said, I did my best and submitted my design this morning, as required. Here is my traditional vertical design. I value the constructive criticism I received. Fast forward to this afternoon and I saw my design earned a blue ribbon. Wow! I really appreciated the judges’ constructive feedback. I received two positives: (1) strong vertical lines. (2) scale and proportion of material good. And I received two constructive criticisms that are well deserved: (1) Proportion of the container to design is too great. 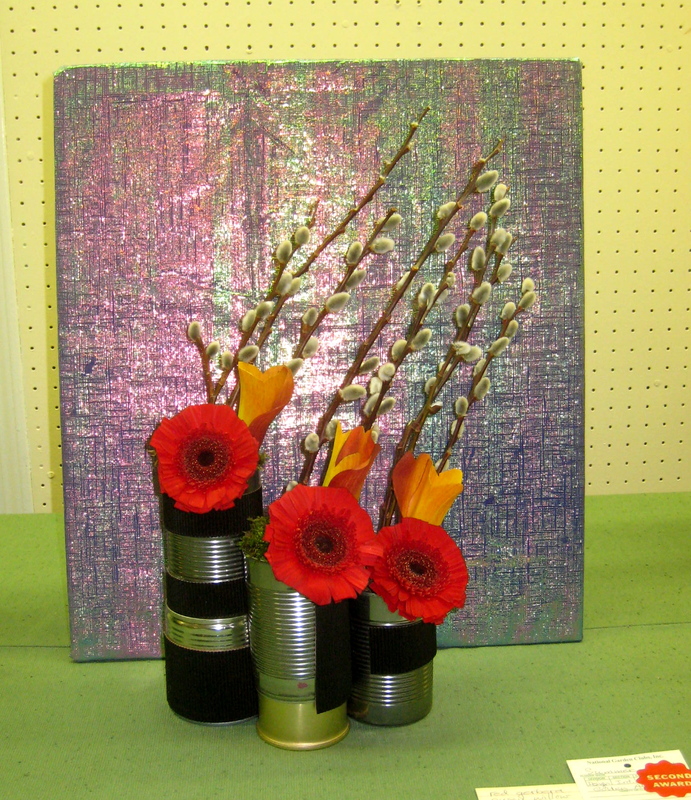 (2) needs more transitional material between vase and design. Okay. I can look at my design and see what the judges mean. Other designs today were lovely. I was able to photograph a few before I had to leave. Take a look! My friend Cynthia created this Advanced I masterpiece: "Creative Line Design placed on a round black pedestal 42" from the floor with a 14" square top." Our club president Karen did this blue ribbon design. I can always pick out Fran's designs as they are rich in color, creative and just plain fun to view! One design I missed photographing was the table centerpiece. My friend Celia designed it. Maybe you can picture it if I try to describe it: From a distance you saw baby birds’ mouths peeping out of a bird’s nest with spring flowers tucked in around. When you looked closely, you saw the “birds” were white calla lilies (with the stems clipped short and tucked in low and tight they looked like little open mouths), a coil of grapevine represented the nest and spring blooming flowers were tucked in along the edges of the “nest.” In all, it was whimsical and clever and very, very spring! Those flowers designs are all beautiful! I can’t even plop a bouquet in a vase and make it look nice. 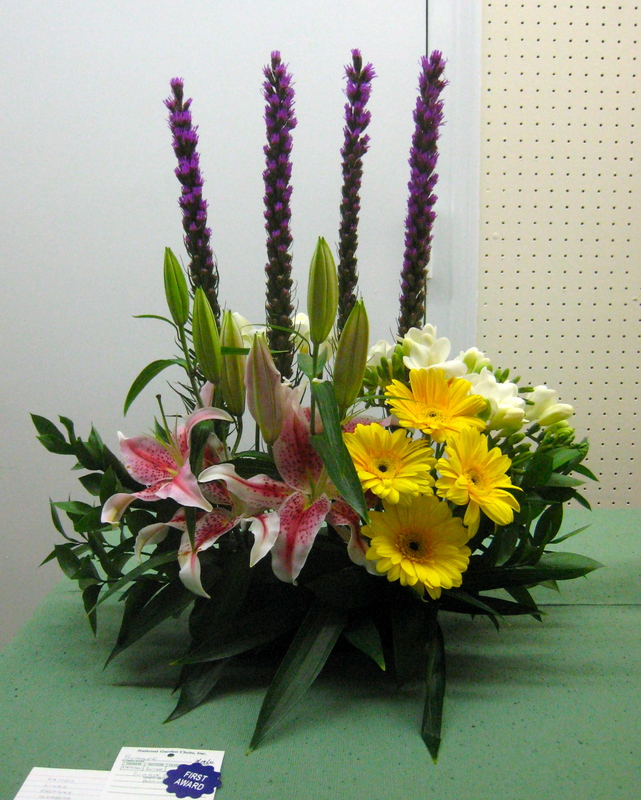 Your arrangement and colors are beautiful! Congrats on the blue ribbon. Looking at these flowers gives me hope of spring. Thank you.